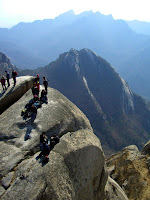 I hiked 북한산 (Mount Bukhan, South Korea) for the first time on 28 February 2009 with 재호 (Jaeho) to enjoy fresh air and surprising views at the highest local peak. We quickly reached the national park by bus from 길음 (Gireum) subway station, hiked three hours to 백운대 (Baegundae peak), lunched at the top, and left by a shorter path closer to 미아 (Mia) subway station. Patches of ice and snow remained but the warm air and clear blue sky favored tee-shirts; I only regret the haze veiling 서울 (Seoul). We hiked through forested mountains, followed the ancient fortifications of 북한산성 (Mount Bukhan fortress), and observed the capital from several perspectives. The closest paths were crowded both ways, and reaching the peak without the metallic cables would have been challenging; only healthy adults free from acrophobia should follow this path. Sandwiches at the top, under the South Korean flag, were a treat. Since my move to South Korea, I frequently scrutinized the mountains from 남산 (Namsan), a hill at the heart of the capital, wondering how the view would be from the opposite side. From our path on 북한산 (Mount Bukhan), the haze mainly revealed the north of the city, and I was surprised by its extent and organization, notably its blocks of identical buildings. Now, I look forward to seeing the city center from a hiking path facing south.